I think it is interesting that we as doctors and practitioners "practice." Wouldn't it be great if we could accomplish all of that education and training, hit the ground running, be perfect and proficient, have everything fall into place, and be super fun and easy right off the bat? Well, I have been in "practice" for over 15 years now and I am still learning and growing every single day, but I have to say, my practice is running smoother than ever. 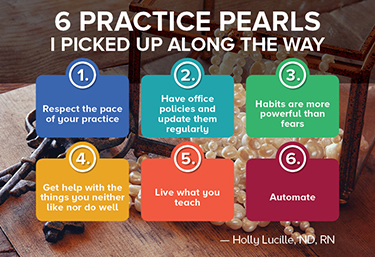 Of course, like our patients, each practice is different; however I have assembled a few pearls of wisdom that I have picked up along the way while working in my practice. I used to freak out a bit if my practice "slowed down." Eventually I learned that this ebb and flow was extremely purposeful. The times when my patient flow was dripping instead of gushing I used for growth in other areas such as, marketing, automation, continuing education, and self-care. I was still "working" and, as I have learned, the patient flow always picked back up and then some. In my early days, I started out with office policies that were fairly standard. As I "practiced" I encountered situations that taught me to shape these policies and make them very specific. For example, I work in Los Angeles where traffic is most always an issue. I also however, run a tight ship and respect other people's schedule and time. Many appointments in my early years were delayed by "traffic" and to me, that wasn't acceptable. Now I have a policy that mentions it. That way, people know exactly what to expect. If they are late, there is a way I deal with that and my patients know it. This has also helped with behavior such as email and phone communication between visits. It has been such a gift to have clear, concise, and updated policies. When social marketing and media became a force for my practice, I admit, I was reticent and even remember throwing a couple of fits. Let's just say I wasn't your "early adopter." When it came right down to it, I was just scared. Scared of the new, scared I wasn't going to post, tweet, blog, or pin it right. Then I decided that habits are indeed more powerful than fears and I created myself a little calendar to push out content with a nominal strategy behind it. It didn't matter how I felt about it anymore, I just did it. With this tactic I became more comfortable and even started to get some engagement. Like anything else this also became easy and fun with practice and time. I loathe bookkeeping, so I hired someone to help me. What a weight off my shoulders! When I first started to practice in Los Angeles, California did not yet have a licensure law in place for naturopathic doctors. I wanted to do the right thing and I wanted to do the right thing right, so at the time, I hired an attorney to help me navigate the laws of the state. Invaluable to me getting started as I did not know of, nor did I care to learn, about the ins and outs of practice in a culture such as that. It is nothing short of a privilege to have the knowledge that I do. What has helped the quality of my practice over the years has truly been the learning of my own body, process, aging, and journey. The more I live what I teach and recommend to my patients, the more congruent and prosperous my life and my practice are. I really hit the skids when my practice got totally automated: online dispensary, e-scripting, and online initial paperwork. Everything has a system around it that is repeated over and over. It makes it so much fun to go to work and see patients! Dr Holly Lucille is a licensed naturopathic doctor, educator, natural products consultant, and television and radio host. She believes in the science, art, and mystery of healing and has a heartfelt passion for the individual wellness of all people. Built on this foundational belief, she uses the magnificence of multiple media platforms to truly make a difference and empower people to heal. Dr Lucille's private practice in Los Angeles, Healing from Within Healthcare, focuses on comprehensive naturopathic medicine and individualized care.